It has been 19 months since my stem cell transplant and I really feel great. I still suffer from some minor respiratory discomfort, that may have some not-so-minor underlying causes (like scorched lung tissue from 33 days of chemotherapy and 15 days of radiation blasted through my chest). Last year, when I rode with the Tahoe cycle team, I sometimes joked that I needed to hang my lungs out to dry over my back fence between rides. I still have days where I feel that way. But the discomfort has been gradually chased away by the joy of regular life. I have been having a great time with my son, who has recently mastered the art of riding a bike with no training wheels. My wife and I adopted two dogs around Christmas (from cycle Coach Kelli's rescue organization! ), and I am having a great time at work (I know that sounds weird to a lot of people, but I love what I do). I recently attended an amazing conference in Las Vegas - the OMG 2012 Stupid Cancer conference. For those of you who are not familiar, Stupid Cancer is a patient and survivor support organization that exists for young adult cancer survivors between 18 – 40 years old. I was one of 550 young adult survivors who gathered to discuss long term health concerns and how we can help the future survivors who are just now experiencing their doctor looking them in the eye and saying, "You have cancer." An outsider looking in might have drawn all kinds of conclusions about the emotional state of the people in that room. There were many of us who blend right in with society, but there were several others with hairless heads, canes, wheelchairs and prosthetic limbs. And we all sported physical and emotional scars that were not visible under our "Stupid Cancer" t-shirts. But the mood was cheery and festive because we were really celebrating the simple existence of life. We were all survivors and members of the same unexpected club. When we broke for lunch, those 550 people shuffled through the corridors to the ballroom at The Palms Hotel and found that the banquet tables were organized by disease. I wandered around the room passing 2 tables for lung cancer, 4 tables for brain cancer, tables for sarcomas, thyroid cancer, a sizable collection of tables for breast cancer, and then a sign that said "Blood Cancers," and then another, and another, and another…then I noticed a matching row next to the first row, and another row beyond that. There was a sea of Blood Cancer survivor tables! While it is true that blood cancers are one of the more common cancers to strike young people, it is also true that there has been a tremendous increase in the discovery and implementation of very effective treatments for Lymphoma, Leukemia and all their cousins and sub-types. That has been possible because of programs like Team In Training and the people involved that are dedicated to raising much needed funds. You are the boots on the ground (or perhaps the cleats in the pedals, for you fellow cyclists). Without your efforts, LLS would be a very different organization, and without their investments in research, people like me might not be alive to write these long blog posts. So keep up the good work. There will be a point in your training season when it gets hard. I remember last year when I was training for my century, it was all fun and games until we got to around 40-50+ mile rides. Every weekend I felt like I was dragging an anchor around mile 37 it just got heavier and heavier until around 46 miles, and then somehow I would find the strength to pull it together and speed up again. So don't give up. You can do this. 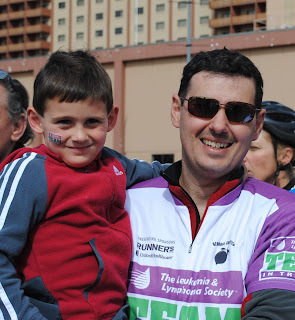 Dan Gennari is a Team In Training alumni having completed America's Most Beautiful Bike Ride in June of 2011. This year Dan serves as the cycle team's honored hero and has been out to support them at their training rides.